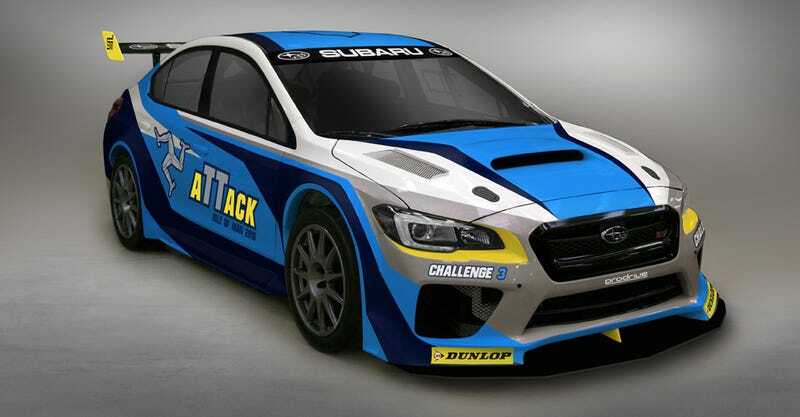 Subaru will try to lay down a new record on the 37-mile Isle Of Man TT course with rally driver Mark Higgins and this beautiful WRX STI. They’ll be trying to beat their previous record of 19 minutes 15 seconds at an average lap speed of 117.510 MPH. This car was completely purpose-built to drive on the Isle Of Man by Subaru Tecnica International (STI) and lauded car-prep outfit Prodrive. Unfortunately that’s pretty much all the detail Subaru is surrendering so far, so stay tuned for a full spec sheet and the actual record attempt, which I have no doubt that Subaru will video for us. Meanwhile I’m going to go ahead and congratulate whoever came up with a race car livery that is both original and awesome. This two-blue-on-white with yellow is really working for me.